In our final economic update of the year, we take a look at the most recent announcement from the US Federal Reserve (Fed) on interest rates and their expectations for 2019 and beyond. Following this we turn our attention to Japan, looking at the Tankan survey and how it could affect the Bank of Japan’s monetary policy. 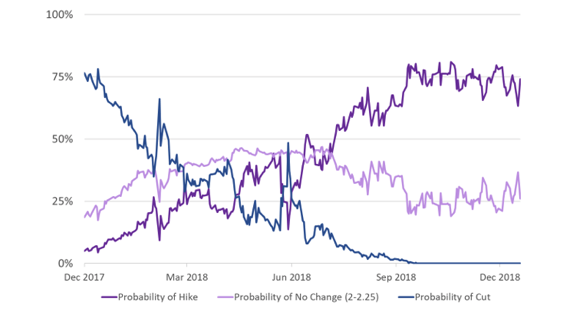 The decision by the Federal Reserve (Fed) yesterday to lift the target range by 0.25% panned out as the majority expected – see probability rate hike chart below. The step up in central bank interest rates, to a range of 2.25%-2.50%, represents the fourth hike in 2018 and the ninth since December 2015. US economic growth trending above expectations, record breaking company earnings and unemployment at a 49-year low are reasons why the Fed think higher interest rates are necessary. When the US economy is expanding too quickly they are duty bound to control inflation to maintain sustainable growth into the future. However, Powell’s actions seem at odds with the present inflation backdrop. Oil prices have fallen significantly, and technology is seemingly still at work, pulling prices down globally. Reflecting on the bigger, global picture President Trump issued the following Tweet ahead of the Federal Open Markets Committee (FOMC) meeting. While we would not agree with all aspects of the tweet he does make some valid points. In the accompanying statement Chairman Jerome Powell remained constructive on economic expansion but recognised troubling aspects for the global economy, in particular, the ongoing US-Sino trade tensions. 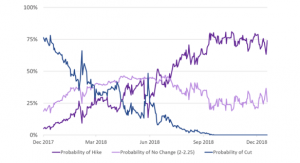 As a result, the Fed shaved their predictions for rate hikes in 2019, from three to two. This tapering of expectations is demonstrated in the ‘dot plot’ chart below reflecting forward looking expectations in September (green) relative to December (purple). Powell also said the Fed will move away from the continuous rate-hike road map, which has gained popularity, towards a data driven policy. In doing so they acknowledge the sensitivity of markets to Fed policy, and the fact that it is harder to predict with clarity how the landscape will shape up. The introduction of the $1.5 trillion fiscal stimulus this year, when the economy was already expanding nicely, has clearly exercised the Fed’s thinking. Meanwhile, Powell confirmed the reduction in the Fed’s balance sheet will continue, giving market participants more influence over price levels as the central bank stays away from buying bonds. Powell’s decision to put up rates demonstrates he will not be intimidated by a Trump administration hell bent on growth. However, there is an equal danger in the other direction. If he is taking decisions merely to ‘stick to his guns’ rather than excercising independence of thought, he will pay a heavy price. Trump does not take prisoners. Moreover, if the Fed honestly, but mistakenly, is too cautious in relation to inflation it will be found to have made a policy mistake. If inflation turns down quickly next year, as some say, a reversal in the Fed’s current higher interest rate policy may come sooner than expected. History will be the best judge. The Tankan, issued by the central Bank of Japan (BoJ), is a survey of Japanese businesses. It captures business sentiment and helps the BoJ formulate monetary policy. As well as capturing a snapshot of current sentiment, the survey pinpoints future levels of expected business activity for the next quarter and following year. Data gathering of this kind helps paint an informed picture of possible business trends across more than 10,000 companies. It culminates in an index, ranging in value from minus (-) 100 to plus (+)100. This allows results to be easily interpreted i.e. higher index readings tend to indicate a more prosperous economic outlook and vice versa if a lower reading. Attention given to the survey is mostly centred around data for large manufacturing firms because they are a leading gauge of Japanese economic growth. The reading from large firms has stabilised at a level of 19, for the second quarter in a row. This is a better result than predicted with the consensus previously forecasting it would fall 4 points lower to 15. As it stands the survey is clearly not indicating prospects for unbridled growth, but as you can see from the chart, today’s level represents a strong bounce back from the 2008 collapse. The primary long-term trend, minus the short-term fluctuations, is upwards. This is encouraging. Other economic indicators, and experts to whom we talk to, indicate business sentiment is being held back by rising US and China trade tensions. As an exporting nation this is not altogether surprising. Japan’s place in the global supply chain makes it particularly vulnerable to higher tariffs on US bound Chinese exports. Manufacturers in China use parts and equipment from Japan to make smartphones and computers, and their factories in China ship goods to the US. Furthermore, when trade tensions deteriorate the Japanese Yen strengthens, reflecting its ‘safe haven’ status amongst currency traders. The consequence of Yen strength is an unwelcome headwind for Japanese exports. The Tankan survey is very wide-ranging. 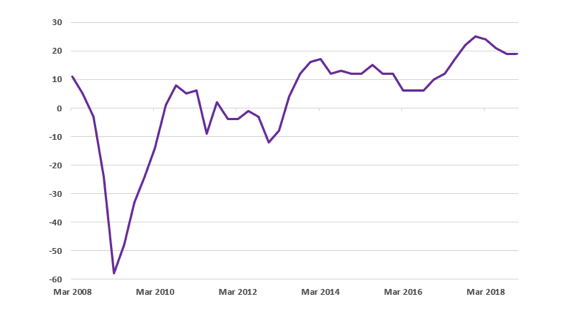 Therefore, media commentators tend to settle on the headline large company manufacturing index, however we look beyond the headlines. One aspect we examine is data on profits. We note profit figures for 2017 were particularly strong, when compared to 2016. However, in the latest survey, profits and net income figures (after tax) are less impressive. But, by digging deeper, we find encouraging data on higher fixed investment, higher research and development (R&D) spending and increased software investment. All augur well for prospects in a competitive world. 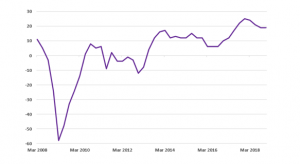 Another facet worth highlighting is what is going on in the labour market. Firms in Japan continue to report employment shortages. Tightening of the labour market will prop up wage growth going into 2019 hinting at faster wage growth which will underpin future consumer spending. When we last reported, in April, the survey overall pointed to a confident economy, but with sentiment caught up in the early cross fire between China and Trump. Regrettably the tensions continue to roll on, representing a headwind that is proving difficult to overcome. Moreover, inflation at 0.5% is still well below the 2% central bank target, and Prime Minister Shinzo Abe is intent on ploughing ahead with a national sales tax increase from 8% to 10% next October. Previous sales tax increases have held consumer spending back and hampered domestic growth. However, this time, a fiscal spending package is proposed. This is to upgrade ageing infrastructure to help withstand earthquakes and the attendant risks of flooding, which have in the past ravaged parts of the country. A boost of this kind to the economy is expected to offset the negative effects from tax rises. Quantitative easing also remains in place and lately a weaker Yen has emerged. This is volte-face to the conventional view that the Yen operates as a haven currency during trade tensions. Something has clearly changed to shift the trade tension/Yen strengthening relationship and, whatever the reason, a weaker Yen, if it is sustained, will promote exports of Japanese goods and services. The Bank of England have just announced that UK interest rates will remain unchanged at 0.75%. The investment team would like to take this moment to thank all our readers for their continued interest in the economic weekly updates throughout the year. These will recommence on the 4th of January and, as always, we look forward to hearing your positive feedback. From all of us at True Potential Investments, we wish you and your families a very merry Christmas as well as an incredibly happy and prosperous New Year.